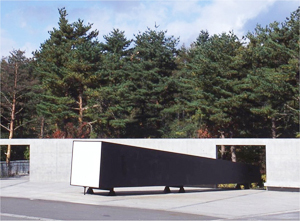 At the Aomori Contemporary Art Centre (ACAC), numerous outdoor sculptures dot the premises instead of a permanent installation gallery. 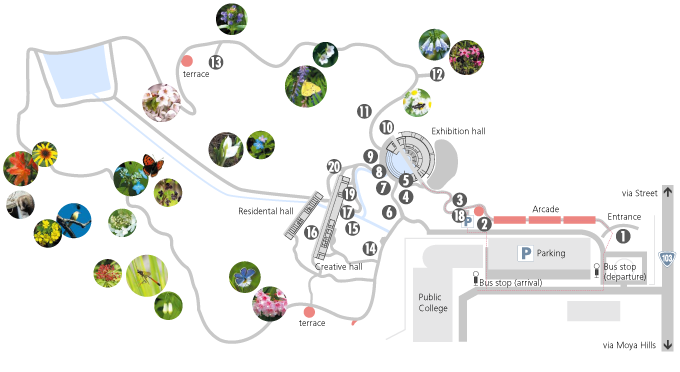 Works are a mixture of those created as outdoor sculptures and those left on display temporarily by our artists in residence. 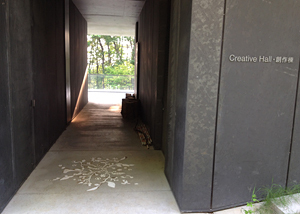 Please enjoy them on your walk through the rich natural environment of the woods surrounding the ACAC. *Please note that there may be muddy areas in the forest. 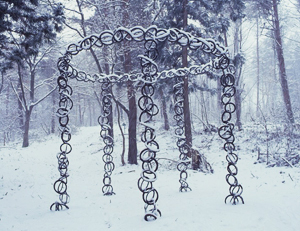 *Sculptures may be unavailable for viewing during the winter as roads may be closed or artwork may be buried under the snow. We ask for your understanding. *Please do not go into the forest during windy conditions as falling branches can prove dangerous. Cor-ten steel, tempered glass, rock salt, 2001. In modern sculpture expression, there are many pieces which tell us something by giving meaning to their materials. What does the “iron” and “salt” used in this piece mean for you? Salt oxidizes the iron, perhaps to call up images of decay and rust. 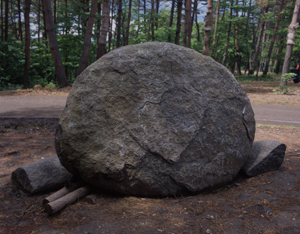 This sculpture indicates the transformative plight of matter, which changes its shape over time in a natural environment. Bronze, copper, brass, acrylic glass, 2004. Tatsuo Kawaguchi has pondered the relationship between matter and things unseen, like time and language. He buried one bronze cane in the turnaround plaza near the ACAC entrance and one more in the small plaza to the side of the water terrace. This was in order to feel Jomon time accumulated deep under the surface. 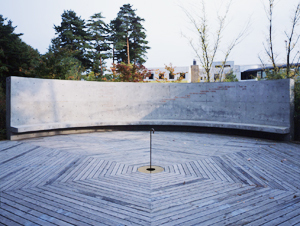 A bronze poem was etched into the concrete wall in the turnaround plaza, and bird houses and bronze rings were hung on seven trees in the “Garden of Time” and an acryl staircase installed. Each is a dedication to the past, present, and future of time. This pieces implements two time-honored techniques: anamorphosis and methods of stone-paving often seen in old European towns. The various types of stones arranged on the ground recalls images of masks of Pre-Columbian Mesoamerica and displays them as mirror images. 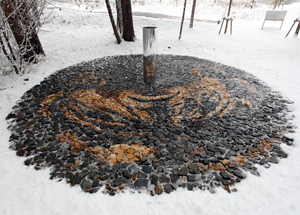 The motive for this production was to give shape to the sensitivity of people living in harmony with Aomori’s nature through stone, exploiting its natural size, shape, and quality to further depict nature. From the front, Hakkoda-san has been carved out, but from behind is “Godiva”, a motif representative of Suzuki’s work. The naked woman astride a horse is based on the legendary ride of Lady Godiva. Marc Barani attaches a great deal of importance to emotional connection with stone. He shares that he is in constant nonverbal communication with stone and this enables him to create pieces in the stone’s desired shape. 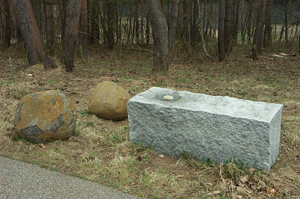 These three pieces produced as the “Inlayed Boulder” series and displayed in the exhibition express Barani’s theme of humanity being protected by and coexisting with nature. 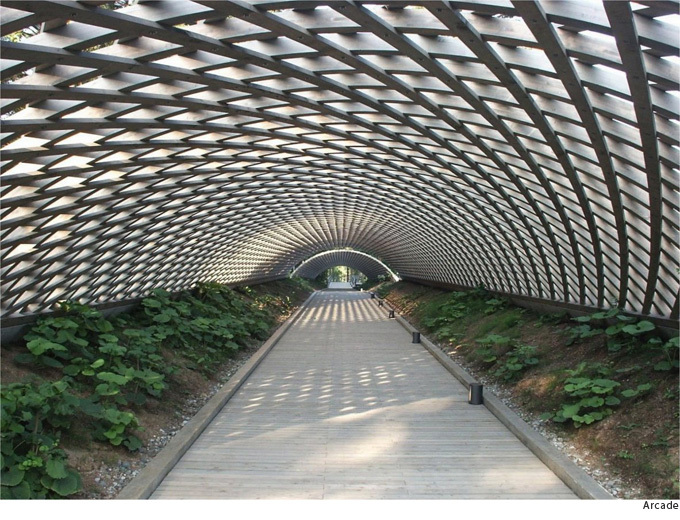 This is a water channel created by combining a 7-meter halved pine tree and granite. The water runs down the surface of the wood and returns again in an endless cycle. This eternal cycle, without beginning or end, is a ring connecting the flow of life. The configuration of near-alive materials is like a small boat or bridge beam or architectural cornerstone. 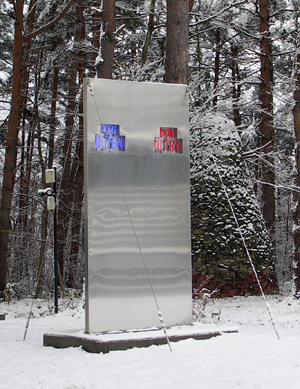 stainless steel, wire, neon light, 2004. In the midst of rich nature, all of a sudden a man-made stainless wall appears. By putting something artificial here, both nature and the wall stand out distinctly; nature appears more abundant and the stainless steel is more beautiful in its artificiality. On the wall are neon signs with the conflicting words “Non Ultra” in red and “Plus Ultra” in blue. 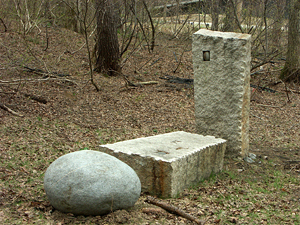 Stone, iron, woods, paint, 2002. 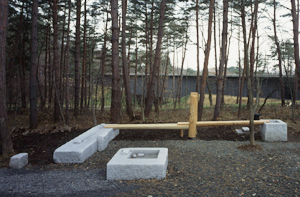 This is a prize-winning piece in the “Contemporary Outdoor Sculpture” genre left in Gappo Park during the Seikan Expo ’88, which was held in Aomori in 1988 to celebrate the opening of the Seikan Tunnel, which connects Honshu and Hokkaido. 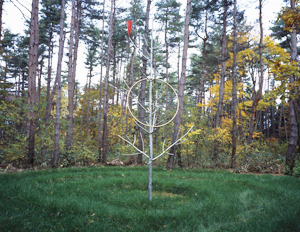 At the time, this piece was divided into two shapes, but was united into one when moved to the ACAC 13 years later after discussions with the artist. 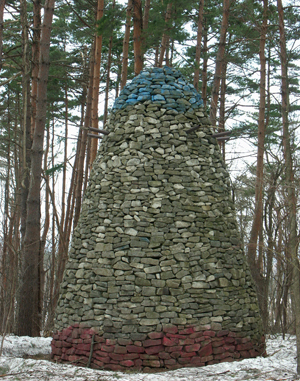 It was created in the shape of a towering bullet by accumulating crushed stone fragments quarried near Aomori City. Its current shape is 7 meters tall and 4 meters in diameter. Six cylindrical bronze pipes stick out of the top, into which deadwood from the surrounding forest is inserted. The skinny, long one is the father, and the slightly thicker, shorter one is the mother. This pair of man and woman can be interpreted as humanity’s original form and the beginnings of life, as if Adam and Eve. 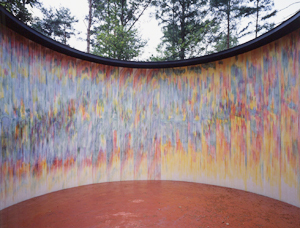 Throngs of thread which Tsuji Kei dyed in an array of colors paint the cylindrically-curved inside walls. If you look up while standing inside, you can see a circular sky. You can feel the ever-changing sky, wind, and air through time and season. This piece is characteristic of being both an iron sculpture and also brings a sense of atmosphere and lightness, which was brought about by repetitively stacking malleable iron after being melted first. It was born to excite an interest in unseen but very real things such as air, vapor, and radiation, while inspired by the overlapping of lights, shadows, and air currents felt by the artist during her stay in Aomori. 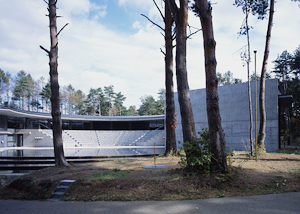 Based in Kansai, UEMATSU Keiji has been engaged in production between Dusseldorf and Kansai since 1974. He continues to create works which illustrate scantly seen relationships that exist in space, such as tension or gravity and its pull. His conical or spiral sculptures combine natural elements like wood and stone with metal configurations to strike an enigmatic balance. 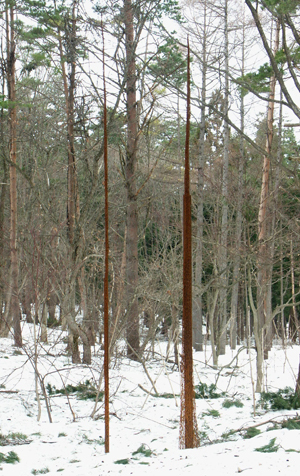 Here a single stainless-steel tree stands deep in the woods with a spiral bank surrounding it. Utilizing the material’s texture and unique characteristic, ISHIOKA Toyomi creates pieces harmonious between art and nature. 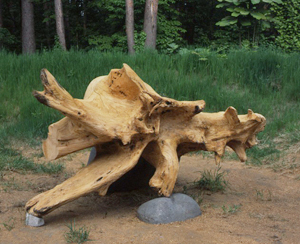 His sculpture using the stump of a huge Japanese cypress exploits a unique organic form. 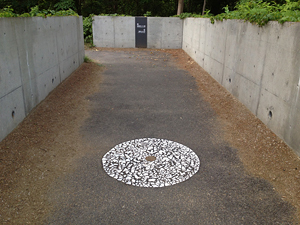 Since 1999, he has been active as a central member of the “Sawayama Art Property Project”, an art forum expanding in the Sawayama area of Aomori City. The human memory which resides in material objects has been the theme of much of Kimio Tsuchiya’s work. 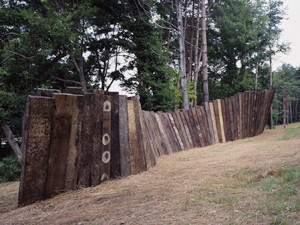 This piece, which uses 360 railroad ties, faces the distant mountains while shaped like a meandering fence through the woods. The old railroad ties trace their roots to former Aomori Station, previously the last stop on Honshu. 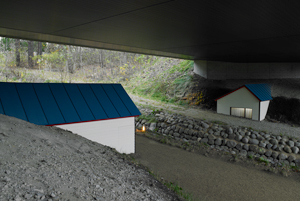 If you walk down the hill from the Creative Hall to the Residential Hall, you will find two intriguing houses facing each other across the river. Although half of these entrance-less houses are buried in the ground, both safety and insecurity dwell there when illuminated at night. 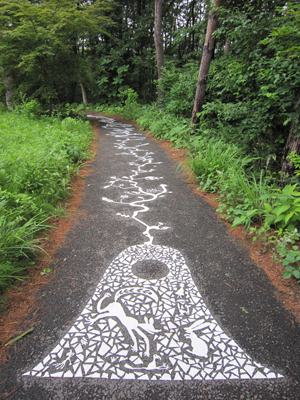 This piece utilizes the same white line material (quick sheet) used for crosswalks and stop signs on the pavement. Yusuke Asai and individuals who use that space cut out the white line material sheet into the shape of plants, which Asai later carefully laid out onto his chosen surface (roads, etc.) to create a composition. Lastly, he used a burner to affix the image and complete the piece.